Summer days are long. Blissfully long. With so many daylight hours in each day, there are many opportunities to make magic happen! With just a little time spent at the workbench and behind the sewing machine, you can create a collapsible play tent for your little ones. Putting the wood and sheet together just so elevates the whole experience from just a collection of sticks and fabric, to a magical play tent perfect for spending long, lazy summer afternoons. Saw your wood to size. If your boards or dowels are longer than needed, use a saw to trim them to the correct size. You’ll need to make sure all four of your 1×2’s are 46 inches long and the three 3/4-inch dowels are 72 inches long. Measure for the holes. At each end of your 1×2’s you’ll need to drill a 3/4-inch hole – that’s eight holes total! To find the proper location, measure 1-1/2 inches down from the end of the board, draw a straight line, parallel to the end of the board. Measure the halfway point across that line (should be at 3/4 inches) and make a mark. Where the line and the mark intersect is where you’ll want to place the center of your drill bit. Drill the holes. Using your 3/4-inch spade bit, drill a hole on each end of the 1×2’s. To prevent splitting, let the drill do the work slowly, don’t force it through. Sand it down. You might need to do a little light sanding on any rough spots. Sew the sheet. Make a simple casing to hold the dowel on each end of the twin sheet. Do this by folding each end of the twin sheet over and pinning in place. The depth of the fold depends on the original length of the sheet. You’ll want the final length to be about 85 inches. Sew a hem across each end. Attach the dowels. Using your rubber mallet, insert one dowel into the hole of two boards. This will be the top of the tent. On the other end of each board, attach the second and third dowel. You’ll want to insert each dowel far enough that about 1-1/2 inches extends from the end. Slip on the sheets. Slip one end of the sheet through one of the bottom dowels. Lift the sheet up and over the top dowel. Slip the other end of the sheet onto the final dowel. Attach the last two boards. As you did with the first two boards, attach the final two. Now, go and gather a few blankets and pillows, find a place to setup your tent and get yourself cozy! 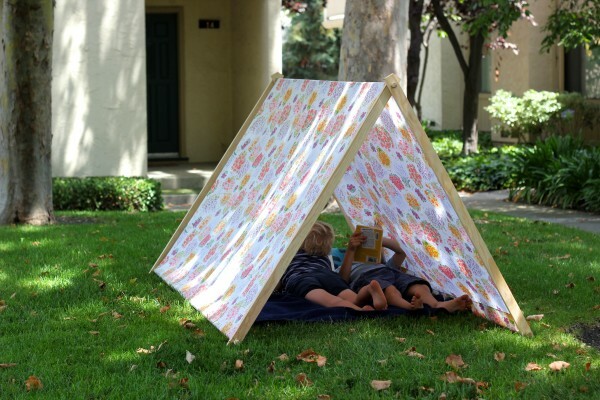 Perhaps you’re not quite ready to build a play tent with wood and sheets – how else could you make a tent? Martin & Sylvia like to do a variety of things in their tent – drawing, reading, snuggling – what would you like to do in your tent? Who would you like to invite in with you? Have you ever gone camping or even just stayed away from home? When Martin & Sylvia return to their room after a day spent out, everything seems bigger to them. How does being away change how you notice things? Saturdays are special days for our creative brother and sister. From enormous art projects in their own backyard to “explorers” adventures up Mooseberry mountain; from mornings of quiet building along the creek, to whole-family canning adventures in the kitchen, the children find fun and inspiration at every turn. Each story is accompanied by a craft or project inspired by the story, and a printable project page for more creative fun.